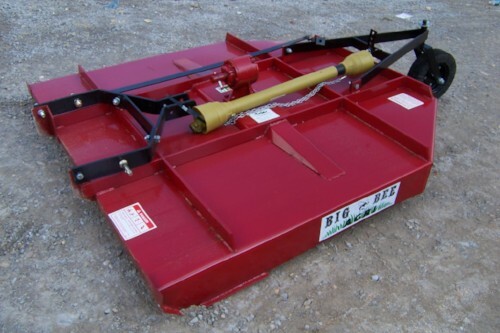 Big Bee Agri Series Rotary Cutters » Darrell Harp Enterprises, Inc. The sturdy one piece heavy gauge steel frame is formed by a uniquely designed machine, then reinforced weldments are added at stress points giving you a dependable frame that can withstand years and years of use. The blade carrier is formed from a one piece 9 gauge steel plate into a saucer like disc with a 5/8" bar welded for extra strength and durability. The unique shape of the blade carrier tends to ride over stumps and rocks, reducing gearbox and driveline failure. The disc also serves as a fly wheel giving you more cutting power. The A frame style three point hitch is a technically designed one piece hitch and attaches to the main frame allowing a fold back or flex action, by means of strap and chain brace when using the rotary cutter in unlevel or terraced areas. This feature sets the Agri Series Rotary Cutter apart from most medium duty rotary cutters. Our flex design eliminates problems common to three point hitches. The 40 hp gearbox has a flange mount that is bolted to a welded, one piece reinforcement plate on the rotary cutter main frame. The PTO shaft has needle bearings in the cross joint and grade 2 shear pins. The technical engineers that design our PTO shafts have assisted us in matching PTO shaft capacity to gearbox and blade shock to give you a PTO shaft for tough jobs. The blades and blade bolts are heat treated and matched to give you a swing action. The design of the blades cause an upward suction when in centrifical motion thus contributing to a lower, cleaner cut.